This PEACE BOOK is an expression of the deep human longing for peace and the belief that global peace is possible. In October 2012 the German-Iranian artist Saeeid Dastmalchian and his wife Cordula launched the peace initiative My Face For Peace, inviting people to “give face” to the wish for global peace. More than 10.000 people from 132 nations joined with touching and inspiring portraits and messages. They all stand united for one vision: Global Peace. 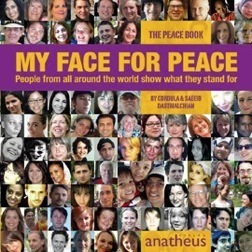 By ordering the Peace Book you support our next goal: international exhibitions. Right now 10408 people have shown FACE for PEACE!